It’s difficult to pinpoint just when the “healthy snack food” trend started, but it’s been climbing more and more over the years. Things like organic tortilla chips, baked potato chips, and vegetable-based snacks are taking up more and more shelf space every year, and companies under pressure are finding it necessary to throw in more buzzwords to stay relevant. 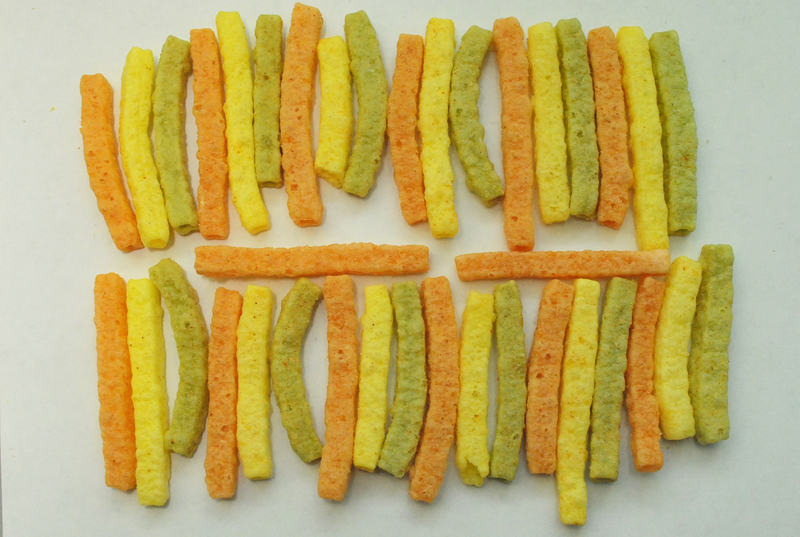 Some of the more curious developments in so-called healthy chips aren’t even chips at all. 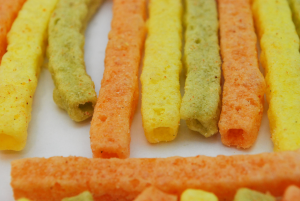 Processed potato starch snacks are nothing new, such as Lays STAX and similar products, but they’ve picked up speed lately in forms like Popchips… and today’s topic, Potato Straws (although this product prefers to be called Veggie Straws). 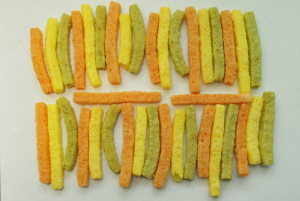 Today we’ll be reviewing Zesty Ranch flavored Garden Veggie Straws by Sensible Portions. They’re literally hollow straws. We thought it’d be pretty funny to drink tomato soup through these. Not having any soup on hand, we drank some water through them, which worked but made them soggy and gross. It was kind of a mistake. The ranch flavor is actually really good and tastes considerably more like actual ranch dressing, unlike other ranch-flavored chips like Doritos. There are much heavier notes of sour cream, garlic, and onion. Speaking of which, what is the difference between Cool Ranch and Zesty Ranch? Is this even what a ranch tastes like? If you live on a cow ranch and can take samples of the difference between Cool and Zesty, please contact us. We are dying to know. The difference between the potato, tomato, and spinach is now indistinguishable underneath the thick layer of flavor dust. This is fortunate if you’re looking for a chip-tasting snack – less so if you’re hoping for something that actually tastes like the other two vegetables alluded to. They’re super crunchy, and the aforementioned seasoning gets all over your fingers and leaves an unpleasant greasy feeling. It makes a big deal on the bag about how you can eat 38 straws. This seems impressive, because a recommended serving of Doritos is 12 chips, but the straws are much lighter and more airy, so it’s actually the same amount by weight… while still somehow managing to feel like you’re eating even less. The word “Sensible” is all over the branding, like a mildly creepy mantra. The serving size is referred to as a Sensible Portion, hence the name of the brand, and the product boasts being guilt-free. That said, these aren’t a very sensible choice when you consider that even competing brands have less of the fat and calories they claim to be better about. At one point, we got curious: how hard are these even trying to be health food? First off, are they fried or not? The bag is completely non-informative and dodges discussing the cooking process. The only hints are in the ingredients list, which lists four different types of oils – coconut oil is in there, but after the flavorings. Second up, these have very little to do with the vegetables they brand themselves as being made from. The alleged tomato and spinach are actually flavorings made from tomato paste and spinach powder respectively, and the snack can only manage to legally refer to itself as a “vegetable and potato snack” on a tiny portion of the bag. Beets are referred to in the ingredient list, but they’re solely for color, not for flavor or nutritional value. A visit to Sensible Portions’ website rewards you with a flashy inaccessible mess, with no HTML-based alternative. Looking for the nutritional facts is a convoluted dead end: there is a page for products, but it provides no relevant information. Clicking on a tiny FAQ link at the bottom will lead you to a frequently-asked question that looks like a lead in the right direction, but it just points you to their broken web store… which doesn’t even have the nutritional facts, ingredients, or allergen warnings that the FAQ claimed it had. This is because the website is five years out of date and has seemingly only managed to survive a handful of layout updates, with no meaningful changes to the text. The ‘online store’ referred to in the FAQ is actually pointing towards a website that no longer exists, and their current store has stripped all of the product information down to vague blurbs. As far as we know, there is literally no way to find nutritional facts on their website. From a consumer standpoint, these chips are a complete disaster that rely on deceitful advertising to brand themselves as something healthier than they actually are. There’s an unnecessary and undeserving focus on its supposed “All-Natural” qualities, despite somehow managing to be even more processed than the leading potato chip brands it’s aggressive towards. As far as an actual snack goes, it’s honestly very, very good, and the ranch flavor is amazing, which is why this snack gets a 3 instead of a 2. But that’s all that can be said. We wish we could get this again, but we have no plans on giving these people any more of our money.